When the Environmental Protection Agency (EPA) released its revised human health risk assessment (RHHRA) of the pesticide chlorpyrifos for public comment, it threw children's health under the Agrochemical bus. Unfortunately, it is routine for EPA to rely heavily, and often exclusively, on industry-supplied data on both the toxicity and exposure of pesticides. By law, the pesticide manufacturer, called the 'registrant', must supply any data that EPA requires of it. This legal authority - which should be a good thing - has wound up with the undesirable practice that EPA sets all its regulatory limits on industry-supplied data, and uses non-industry information rarely if at all. This too-cozy relationship between EPA regulators and the industry it is supposed to regulate is demonstrated in EPA's recent chlorpyrifos risk assessment. This is a tale of two scientific evidence streams, one from independent academic researchers from Columbia University in New York City reporting that prenatal exposure to chlorpyrifos causes neurological impairments in children, and the other from Dow AgroSciences using its own mathematical model to derive an acceptable level of chlorpyrifos exposure for the population including pregnant women. The bottom line is that EPA relied on the Dow model to set an unsafe exposure limit shown in the Columbia University cohort to increase the risk of mental and motor delays in children exposed to chlorpyrifos prenatally. You may need to read that twice, it is so hard to believe. The Dow-EPA approach relies on a complex model that figures out how much chlorpyrifos a person would have to be exposed to in order to cause a reduction by 10 percent in the activity of a particular protein, an enzyme called acetyl cholinesterase, or AChE. In a normally-functioning system, after a nerve cell has been activated, AChE provides the important shut-off switch to stop the activity. For example, if the nerve cell is stimulating a muscle cell to cause a muscle contraction, it is important to stop the activity and let the muscle cell rest between contractions. Important targets include muscles, sweat glands, the digestive system, and even heart and brain cells. AChE inhibitors like chlorpyrifos, block the AChE from doing its shut-off job, and the result is over-stimulation of nerve cells, which is enough to kill an insect at low doses, but at higher doses can sicken or harm people too. That's why chlorpyrifos poisoning feels like all the nerves are turned on and won't turn off. Clinical symptoms of organophosphate poisoning can include: eye pupil contraction, increased salivation, nausea, dizziness, confusion, convulsions, involuntary urination and defecation, and, in extreme cases, death by suffocation resulting from loss of respiratory muscle control. Unfortunately, the Dow model and EPA presume that 10% inhibition of AChE is like a 'no effect' level, and wouldn't lead to harm in people, even if it were prolonged for weeks on end. While this may be true for the general adult population, it doesn't appear to hold true for the children in the Columbia University study born to mom's exposed to chlorpyrifos while pregnant. EPA estimated that the pregnant moms in the Columbia University study likely had no more than 0.5% inhibition (RHHRA, EPA 2014 page 42), yet the children exposed prenatally had mental and motor delays. In fact, using the Dow model, EPA has set an exposure limit for the population of 0.78 micrograms of chlorpyrifos per kg body weight per day (0.78 Âµg/kg-day). The moms in the Columbia University study were exposed to less than 0.5 Âµg/kg-day and their children showed lasting neurobehavioral deficits. The Dow/EPA approved dose is 2.6 times higher (less protective) than calculated in the 2011 chlorpyrifos preliminary risk assessment (EPA 2011) and 26 times higher (less protective) than the 2000 risk assessment for chlorpyrifos (EPA 2000). By relying on Dow's model to weaken health protection for children EPA is moving backwards. But, the problems don't end there. The Dow model was validated against the exact same dataset that was used to calibrate the model. It's like asking yourself for a second opinion to validate your initial opinion. Even worse, although much of the model is based on animal and cell data, some flawed human data are also included. The problem is that the human data are from a Dow-sponsored intentional dosing studies on human subjects that failed EPA's internal ethical review and was determined to have some serious scientific flaws by an expert review panel (Carley memo 2009; HSRB 2009, 2011). Over fifteen years ago, EPA acknowledged that chlorpyrifos was so toxic to children that home uses could no longer be allowed. Children crawling on treated carpets and hugging pets after flea treatments were exposed to dangerous levels. Seeing the writing on the wall, the chemical makers agreed to cancel homeowner uses of chlorpyrifos in 2000, but negotiated with EPA to let many agriculture uses remain. Chlorpyrifos is still used on an extensive variety of crops, including fruit and nut trees, vegetables, wheat, alfalfa, and corn. In 2006-2012, chlorpyrifos was applied to more than half of the country's apple crops. About 5-10 million pounds are used annually in agriculture. It is also used on golf courses, for adult mosquito abatement, in greenhouses and for seed treatments. The problem with permitting agriculture uses of such a dangerous pesticide is that people living on or near farms continue to be poisoned. Farmworkers include pregnant women and teen-agers, and pesticides drift and volatilize off fields and onto neighboring homes, school yards, and parks where pregnant women and children live and play. Chlorpyrifos has not been used safely in the past, and this new assessment will not make it safe for future use. 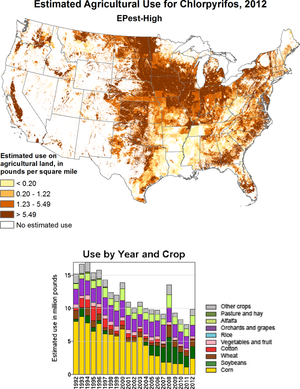 It is time to ban chlorpyrifos, and move forward with non-chemical and reduced-risk alternatives (see NRDC report Fields of Change: A New Crop of American Farmers Finds Alternatives to Pesticides). Note - If you ever feel that you or a family member has been poisoned by a pesticide, please report it so that you get the help you need, and it can be included in the data on poisoning incidents. Without data, there is no record of harm.